Increasing carbon stocks in soils with conventional means e.g. conservation tillage, use of manures, and compost, conversion of monoculture to complex diverse cropping systems, meadow-based rotations and winter cover crops, and establishing perennial vegetation on contours and steep slopes can sequester carbon. The sequestration potential depends on climate, soil type, and site specific management. The drawback of carbon enrichment with conventional methods is that carbon level drops rapidly again, as soon as the required careful management is no longer sustained. Carbon contents of cropland increases only if either carbon additions (in form of plant biomass) are enhanced or decomposition rates reduced (20). Only one-third of the aboveground residues remain in the soil after 1year and only 10-20% remains after 2 years. Furthermore the addition of degradable crop residues and reduced tillage systems can increase nitrous oxide and methane (N2O and CH4, both potent GHGs) emissions substantially. 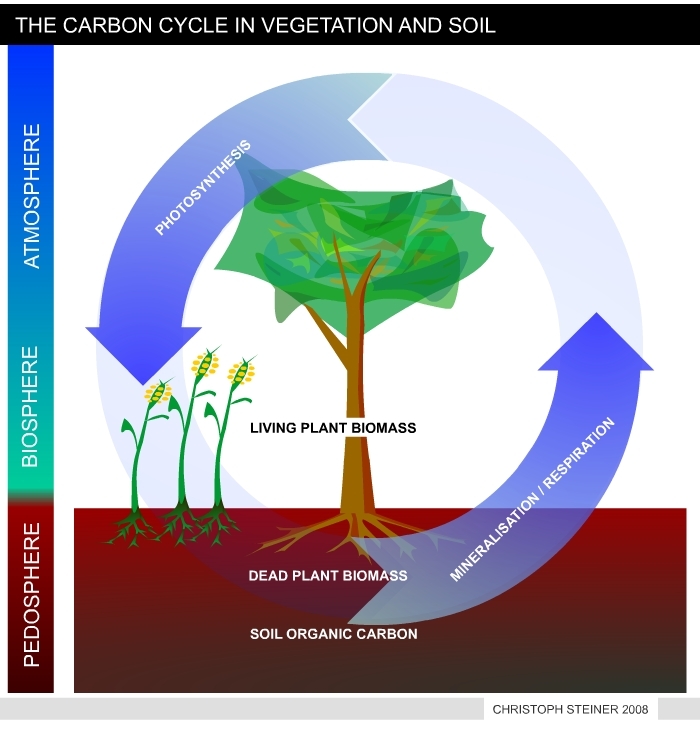 Figure 8 shows a simplified version of the carbon cycle in vegetation and soil. Plants take CO2 from the atmosphere to synthesize tissue (plant biomass). As long as biomass is growing it accumulates carbon. During decomposition of dead biomass and humus the carbon is released as CO2. In undisturbed ecosystems the accumulation and release of CO2 is in equilibrium. 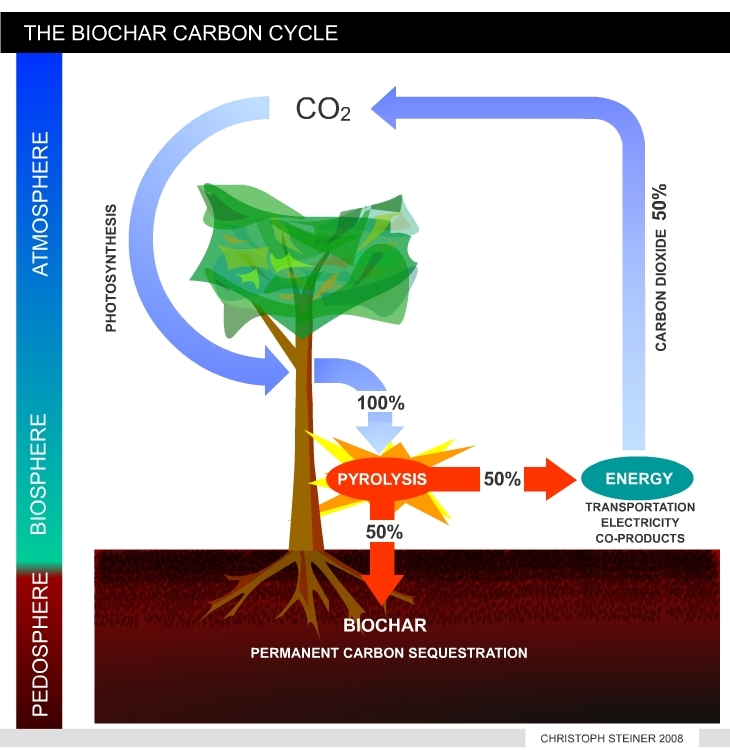 Figure 9 illustrates the manipulated carbon cycle due to bio-char carbon sequestration. Biochar is recalcitrant against decomposition and remains in the soil for centuries or mil-lennia. Thus pyrolysis can transfer 50% of the carbon stored in plant tissue from the active to an inactive carbon pool. The remaining 50% of carbon can be used to produces energy and fuels. This enables carbon negative energy generation if re-growing resources are used. (I.e. with each unit if energy produced CO2 is removed from the atmosphere). Reduced decomposition is an advantage of biochar (Figure 10). Biochar formation has important impli-cations for the global carbon cycle. In natural and agroecosystems residual charcoal is produced by in-complete burning. As the the soil carbon pool declines due to cultivation, the more resistant charcoal fraction increases as a portion of the total carbon pool (21-23) and may constitute up to 35% of the total (23). Carbon dating of charcoal has shown some to be over 1500 years old, fairly stable, and a permanent form of carbon sequestration (7). Inspired by recreation of Terra Preta, slash and char was described as an alternative to slash and burn (24). If a forest is burned, only around 2-3% of the above-ground carbon is converted into charcoal (25), but charcoal production can capture 50% of the above-ground carbon. If re-growing resources (fallow vegetation or crop residues) are used, slash and char could become a significant carbon sink and an important step towards sustainability of tropical land use systems. The global potential of biochar reaches far beyond slash and char. Systems (pyrolysis) converting bio-mass into energy (hydrogen-rich gas and bio-oil) and producing biochar as a by-product offer an opportunity to combine renewable energy production, carbon sequestration and soil restoration. Biochar can be produced by incomplete combustion from any biomass, and it is a by-product of the pyrolysis technology used for biofuel and bioenergy production. The carbon cycling from photosynthesis and decomposing organic materials is 50 to 60 billion tons (Gt) per year and land use emits approximately 0.5 to 2.7 Gt of carbon (Figure 2). It would make a significant global impact, if only a small fraction of this carbon flux is altered by biochar carbon sequestration. Carbonization of agricultural and forestry wastes could capture 0.16 Gt carbon yr-1. If the demand for renewable fuels by the year 2100 was met through pyrolysis, biochar sequestration could exceed current emissions from fossil fuels (26). Figure 10 demonstrates the historical knowledge about the recalcitrance of charcoal. 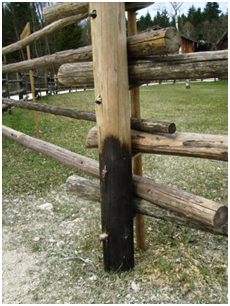 Wooden poles were (are) blackened (carbonized) on the outside to increase their persistence in soil (photo C. Steiner).